Galvanized Staple type SJK 08 mm with a crown size of 4,2 mm. 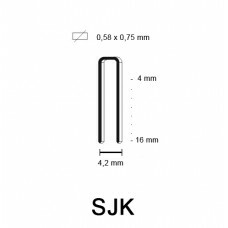 Qty: 10.000 pcs per box NOTE: th..
Galvanized Staple type SJK 10 mm with a crown size of 4,2 mm. Qty: 10.000 pcs per box NOTE: th..
Galvanized Staple type SJK 14 mm with a crown size of 4,2 mm. Qty: 10.000 pcs per box NOTE: th..
Galvanized Staple type SJK 16 mm with a crown size of 4,2 mm. Qty: 10.000 pcs per box NOTE: th..